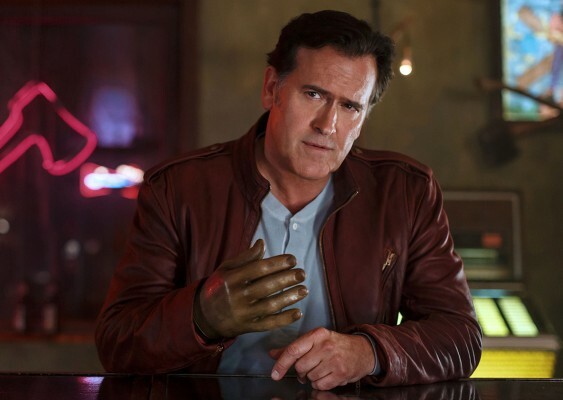 “Never get between a papa bear and his cub.” This week, Starz released a new teaser for season three of Ash vs Evil Dead. A sequel to the Evil Dead movie trilogy, the horror comedy follows Ash (Bruce Campbell) as he resumes his fighting persona and works to save the world yet again. The cast also includes Ray Santiago, Dana DeLorenzo, Lucy Lawless, and Michelle Hurd. Season three of Ash vs Evil Dead premieres on Starz on February 25th at 9 p.m. ET/PT. Beverly Hills, Calif. – October 31, 2017 – Ash is back and evil is about to get schooled. Today, STARZ released the first teaser trailer for the 10-episode third season of the horror-comedy series “Ash vs Evil Dead,” just in time for Halloween. The third season finds Ash, having gone from murderous urban legend to humanity-saving hometown hero, discovering that he has a long lost daughter who’s been entrusted in his care. When Kelly witnesses a televised massacre with Ruby’s fingerprints all over it, she returns with a new friend to warn Ash and Pablo that evil isn’t done with them yet. But evil will learn to never get in between a papa bear and his cub. What do you think? Are you a fan of Ash vs Evil Dead? Are you looking forward to the new season? More about: Ash Vs Evil Dead, Ash Vs Evil Dead: canceled or renewed?, Starz TV shows: canceled or renewed? Ash Vs Evil Dead: Is the Starz TV Series Cancelled or Renewed for Season Four? They shouldn’t have pushed back the premiere honestly.